Are you fan of khaki? If yes, then I am more than happy to show you this year's best ways how to wear khaki fashion trend. What does it bring us this year? It's all about freedom of choice my dear reader. It's all about military laidback look that can be mixed and matched with our everyday basics. How does it works? You can just throw on a khaki cargo jacket and pair it with cool jeans and striped T-shirt, there you have it. Yes, it's so easy. Be sure to wear only those clothes that make you feel comfortable. Believe me, there are so many awesome ways to wear this trend in real life. We see khaki jacket styled with graphic white tank top and black mini shorts. This year is all about mixing various styles together, including 1990's grunge, cargo pieces, sport style, stripes, etc. Personally, I love this trend for its easiness. 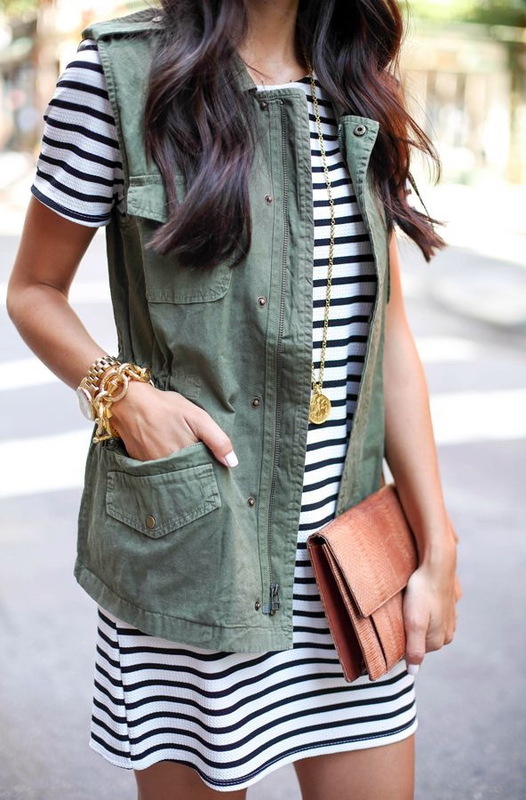 You can incorporate khaki into your wardrobe, making it look laidback chic, glamour, casual or whatever you like. The khaki green looks great with grey, camel, black and white shades. The army inspired shade automatically makes any outfit look military inspired. Once you try khaki clothes you look hot, powerful and structured. The great paradox of khakis is that you can wear relaxed fit khaki jacket but you still look structured and sophisticated. All in all, I gathered my favorite pieces from this trend to try on next season.